Apple closed the book on its fiscal 2016 with a quarterly earnings conference call, marking the end of the first year where iPhone sales declined. However, Apple is bullish on its outlook, particularly with the newly released iPhone 7 series and a growing services business. 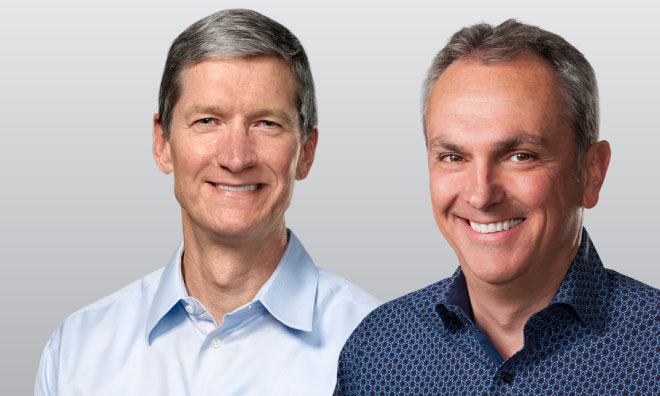 Participating in Tuesday's conference call with analysts and members of the press were Apple Chief Executive Tim Cook and Chief Financial Officer Luca Maestri. Notes of interest follow. iPhone ASP edged slightly higher above $600. The company expects a marked increase in iPhone ASPs in the December quarter, reflecting the launch of the iPhone 7 and iPhone 7 Plus. Maestri cited a survey saying that 79% of consumers planning to buy a smartphone in the December quarter will choose an iPhone. "On an anecdotal business, the upgrade programs are a win," Cook said of the iPhone 7 launch. Cook said Apple will likely catch up with iPhone 7 demand by the end of the quarter. He's less certain about iPhone 7 Plus. Cook highlighted how Aetna is subsidizing Apple Watch for customers to encourage healthier lifestyles, and also distributing the wearable among 50,000 of its own employees. Cook said Apple expects to have more than 100 certified HomeKit accessories available before the end of the year. Nodding to the recent Internet of Things botnet attack that took down huge swaths of the internet, Cook noted that Apple's HomeKit only allows approved devices to ensure customer security. Apple once again cited best-in-market purchase intentions among consumers and businesses for iPad. Satisfaction ratings for the iPad are also north of 90%. Revenue is projected between $76 billion and $78 billion, representing a return to growth and an all-time record. Gross margin is expected to be between 38% and 38.5%.